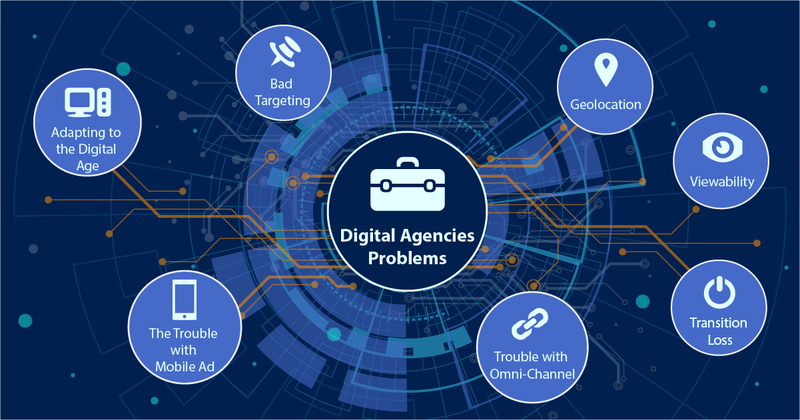 What is the future of digital ad and how to get rid of breakdowns? What do the digital agencies do and what the tasks? A digital agency defined as a company that provides creative, strategic, and technical development of screen-based products and services. A fully digital agency can offer customers search engine marketing, online advertising, web design and development, and e-commerce consulting. Digital advertising not only provides the most significant audience but is also cost-effective, based on statistics and the target audience. Many people perceive marketing rather superficially. For users who are far from the internal twists and turns of the advertising market, it seems that the work of a marketer or “advertiser” is reduced solely to coming up with bright advertising and catching it in a prominent place. Nevertheless, Internet advertising is a whole world filled with complex algorithms and analytical systems. And, as is often the case, systems do not always work as they should. One of the main tasks of any marketing is to measure the effectiveness of the campaigns. The Internet greatly simplifies this task. Due to the fact that the Network allows you to establish two-way communication, marketers can analyze the response of a particular user to specific content. The expert sees what advertising the user watched, what actions he performed after clicking on it, whether he returned to the original site after viewing, etc. Unfortunately, even this effective system is not without flaws. At the moment, the marketer cannot be one hundred percent sure that the data obtained are correct. There are technical nuances that can affect the accuracy of tracking user activity. However, every year the system becomes more reliable. Today’s digital age has collapsed like a whirlwind storm. Marketers had little time to learn before the training wheels failed. Before most people had mastered social media marketing, everyone began to hear about big data and analytical tools that generate previously unseen insights. However, many barely had time to look before trying to adapt to the mobile boom. Worse, all these technologies and new platforms are developing as rapidly as the digital age itself. The fact that one day considered “the best practice of marketing in social networks,” the next day may look very different. The fact is that many marketing agencies switched to social networks so quickly that they did not know how to measure their ROI. Even years ago, 66% of marketers claimed that measuring social media ROI is a struggle. Only 9% of marketers today say that they can quantify income managed by social networks. It means that most do not even know if their efforts in social networks are effective. Successful marketing agencies will confirm that finding the right segment can be a problem. In fact, 72% of marketing agencies admit that they do not know what their goal is, but 59% of financial directors claim that the business analyst is their number one priority. It means that the guys at the top are willing to spend money to find out what is essential for their customers. Big data and analytical tools are of great help in choosing the right segment. Big data is not just digital information and online behavior. The value of how to focus on customers through several different lenses makes sense.Internet searches, social purchase signals, web mining, crowdsourcing, transactional data, just by looking at the data through these lenses, it's possible to sort them into useful information. Studies show that companies that use big data to target the right customers, surpass their competitors by 20% in all major indicators. With the correct data and the right analytics solution, it's possible to get valuable information about which target source is best for the organization and will provide the most long-term growth. Is a technical error, in which part of the statistics lost merely. For example, the advertising management system records that the user clicks on the advertising material, and the analytics system on the client’s website does not record any activity. The reasons for this may be many. For example, the user does not close the site. Or analytics fixes the transition in some other way. Unfortunately, with the advent of new analytics systems, such losses are increasing. Earlier, losses of 10-20% considered the norm, but now the discrepancy can reach 60-80%. This is a very disturbing trend. However, the market is well aware of the problem and is trying to solve it. The volume of mobile traffic is growing by leaps and bounds. With it, the number of ads targeted at users of mobile devices is increasing. But, unfortunately, technology does not keep up with this growth. For example, at the moment many analytics systems and auditors do not know how to work with cookies. Because of this, marketers lose some vital information. So, experts still have a lot of work to standardize online advertising and optimize their accounting systems. Another cause for disagreement is the determination of the location of the user. Advertising management systems use databases of IP addresses that allow determining the area, city or street from which are viewing ads. The problem is that different advertising management systems and different auditors use different bases. This causes errors and deviations. An important indicator of the effectiveness of online advertising is the so-called parameter "viewability." This is a metric that allows tracking the actual display of advertising and the time it stays within view of the user. According to Google, only 56% of ads loaded in a visible area. Considering the cost, a rather strange situation is created, in which a less effective, in terms of viewability, advertising costs more. At the moment, the expert group is trying to develop a standard that will determine by which parameters the viewability indicator should be taken into account and how to track this indicator in practice. The digital era has brought many new marketing channels to agencies. Determining which channels the target consumers are on is the most straightforward task. The more marketing channels used, the harder it is to maintain a single voice and brand image. Studies show that 87% of buyers believe that brands need to put more effort into ensuring constant customer interaction. Today, the consumer wants to get a new experience every time he interacts with a brand on social networks. Thus, simply placing content across all channels can have a negative impact. To correct this negative experience, it is necessary to narrow the active channels to the most necessary. It is required to find out where the target consumers are most active and strike directly through these channels while ignoring the rest. This will help ensure that all efforts directed to those areas that will bring the most significant return. It also helps to limit the number of duplicates that are published on various channels, thus increasing interest. Today, you cannot go online without seeing an article about the death of advertising. Advertising agencies are getting the squeeze, and things are likely to get worse. What’s the way forward? The main problem that customers don't trust advertising for the most part. They are tired of being interrupted. Many are blocking ads altogether. Today we have four trends that are trying to solve these problems like performance marketing, influencers, entertainment, and platforms. There will be winners and losers among agencies, brands, and media for each trend. The assumption is that one of these trends will dominate the future. As effective marketing, advertising is a whole galaxy, managed by Google, Facebook and Amazon. Effective marketing is to provide customers with more targeted, relevant and fast advertising. Today, it's possible to target someone next door who likes burgers with an ad about burgers from the local joint at lunchtime on Facebook. Brands will continue to pay for Google, Facebook and Amazon to play on social platforms. The digital giants will own the data, the relationship and the rules of the games. Amazon, who owns the last mile, might become the biggest winner in this game. For brands and ad agencies as customers move to ad-free platforms, the pool of customers is going to shrink -- think Netflix, YouTube Red, and HBO, all of which are ad-free. Brands will continue at the mercy of Google and Facebook's walled garden. Agency work will become more tactical. Big brands are likely to bring social media capabilities in-house to reduce cost. Brands are still playing in the same sandbox. They are just using a different vehicle. Brands still need to pay attention to social networks to amplify the message. Influencers also win in this game, though they are likely to get taxed by the social networks more. While brands might address the credibility problem, they are still at the mercy of influencers. Social networks will own the data and relationship. The agency’s role will significantly diminish under this model. Today brand owns the data, the relationship and the rules of engagement. The agency can play a critical role in helping brands develop the value proposition, design the system and communicate with customers. To pull this off, agencies need to be consultants, and consultants need to be agencies. Helping clients design and manage platforms requires bringing business, brand, design, operation, and technology together. Many agencies don't have the depth to play at this level. No wonder consulting firms are moving aggressively to this space. A lot has changed, and a lot will continue to change, with regards to marketing in the 21st century. The digital age has rocked marketing to its core. When it comes to the unique challenges facing marketing agencies today, it is easy to get overwhelmed and hit obstacles trying to adapt to the continually evolving “best practices.” Digital marketing trends seem to move at light speed, which can sometimes cause marketers to take a passive, wait-and-see approach, but this stagnant behavior can lead to poor performance and growth. Sometimes, you have to take risks and jump on trends that aren’t fully tested and proven. 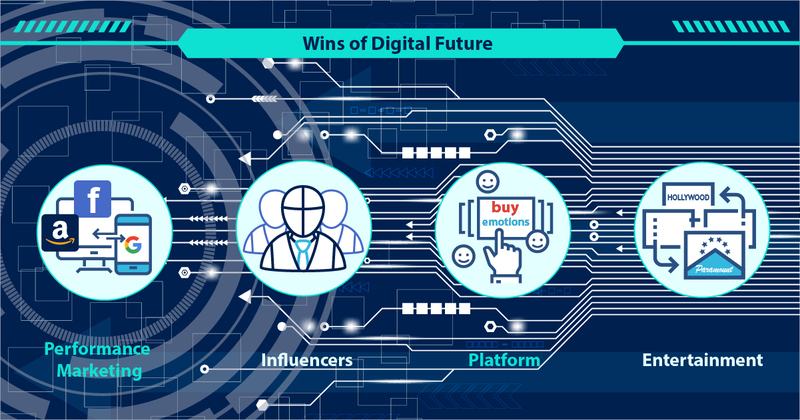 And well, in the world of such a rapid flow of information and ever-changing trends, an agency providing digital services is simply obliged not only to show the results here and now, but also to understand and feel the future trends. Nevertheless, the human function will be more managing, and we transfer all data for collection and analysis to intelligent, fast, and error-free robots. There are already a number of developments in our portfolio that can completely change the work of any agency forever. They will allow to manage and create trends, and we delegate continuous manual operations to machines. Is an excellent platform for optimizing advertising campaigns. It operates automatically 24/7, providing entirely accurate reports, which can be wholly trusted. The application can redefine the rules of the impressions, change rates and budgets, change hundreds of combinations, massively create companies, download content, etc. The app boost ROI, save time and generate more revenue by entirely automating natural ads campaigns optimization process. 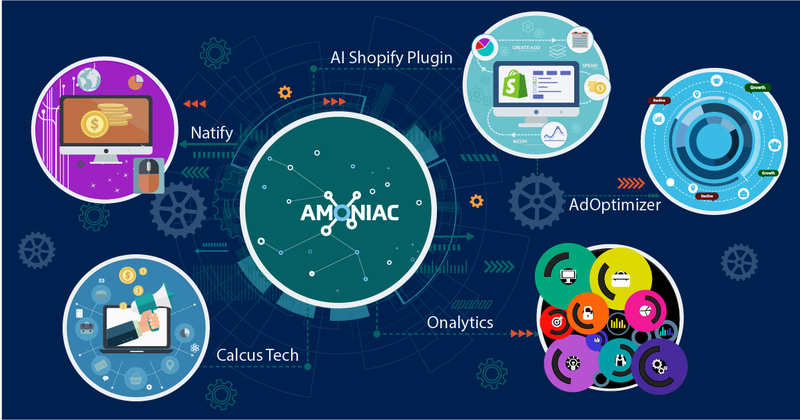 Is an application that allows you to connect Amanda AI Service to an online store on the Shopify platform. You can configure and manage the Amanda App directly from the admin panel. The application has the Dashboard option, which allows users to track statistics on advertising costs and revenues from it, as well as set a daily budget. Is a platform that offers to improve SEO processes through a set of internal and external optimization measures to raise the site's position in search engine results. It compares the average indices of customers and competitors by such parameters as visitor management, conversions, search traffic, PPC traffic, social media traffic, mobile and gives its general and priority recommendations in the consolidated analytical report. 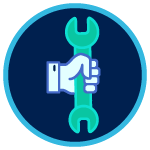 Onalytics is a tool that shows the effectiveness of the site in comparison with competitors and subsequent actions to achieve the highest score. It is only a small part of what functionality can still be done and how to optimize the work of any digital business. All cases are available for orders and any modifications. Also, if you have any ideas, please, contact us directly by hello@amoniac.eu or +372 5770 7573.